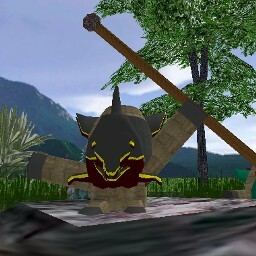 Simbusians are a small and simple tribal race living in the extreme eastern part of the Irenic Ocean on a tiny island named Hurutulughunuga Isle (Huru Isle for short). The race is currently known for their wearing of tribal fish masks and large amounts of clothing. Simbusians have the unique ability to wave their arm in one direction while the spear they are holding in that hand goes the opposite direction.